US crude oil stocks posted a large increase of 7.0 MMBbl from last week. Gasoline and distillate inventories decreased 7.7 MMBbl and 0.1 MMBbl, respectively. Yesterday afternoon, API reported a crude oil build of 4.1 MMBbl alongside gasoline and distillate draws of 7.1 MMBbl and 2.4 MMBbl, respectively. Analysts were expecting a crude oil build of 2.3 MMBbl. The most important number to keep an eye on, total petroleum inventories, posted an increase of 4.1 MMBbl. For a summary of the crude oil and petroleum product stock movements, see the table below. US crude oil production remained unchanged last week, per the EIA. Crude oil imports were down 0.16 MMBbl/d last week, to an average of 6.6 MMBbl/d. Refinery inputs averaged 16.1 MMBbl/d (251 MBbl/d more than last week), leading to a utilization rate of 87.5%. Price rally that paused due to a lower economic growth forecast from the International Monetary Fund (IMF) and Russia stating it does not support extending supply cuts continued today, despite the bearish inventory report as crude oil and total petroleum stocks both posted sizeable gains. Prices are getting support from the unrest in Libya potentially threatening its oil supply and continuing OPEC supply cuts. Prompt-month WTI was trading up $0.21/Bbl, at $64.19/Bbl, at the time of writing. Prices continued their climb early into this week as WTI hit its five-month high on Monday and edged near the $65/Bbl mark, while Brent reached the closely watched $70/Bbl mark. However, bearish news on Tuesday brought an end to the rally, as prices gave up some of their gains after bearish news from the IMF and Russia. Continuing OPEC+ production cuts and further declines from Venezuela and Iran due to unrest and sanctions continued to support prices. Prices rallied to their fresh five-month highs on Monday, largely on the concerns about lower production from Libya, as the Libyan National Army launched a campaign to take over Tripoli. Although it is too early to assess what this means for the country’s oil supply, the possibility of lower production due to unrest pushed prices higher as global supply levels are already tightening. Also supporting prices were the US-China trade talks coming to an end for the time being and officials stating progress is being made. Although sentiment has completely shifted to bullish with tightening supply levels and news from Libya, prices retracted from their five-month highs quickly due to worries about global economic growth and Russia’s comments on easing the supply-cut deal. A threat by the US government to impose tariffs on European goods as well as IMF lowering its global economic growth forecast, once again brought back the fears of a slowdown in global economic and demand growth. Russian Energy Minister Alexander Novak said an extension of supply cuts would be unnecessary if the market were expected to be balanced in the second half of the year, which signals Russia may not be willing to participate in further reductions and could potentially increase production even if OPEC decides to proceed with supply cuts after June. Last week’s trade closed over $63.00/Bbl, the highest weekly close since the last week of October 2018, just before the market declines accelerated. Market internals have developed a bullish bias, however, and are now entering overbought levels. The trade may extend the gains and test the $65/Bbl range but will need more bullish headlines to support this level before it finds some selling. The market will closely watch any news surrounding Iranian sanctions, Libyan supply levels, and US-China trade talks. Any slight shift in sentiment due to fundamentals or bearish news could cause a consolidation phase, with a potential retracement back to the $60/Bbl range. US crude oil inventories posted an increase of 7.2 MMBbl last week, according to the weekly EIA report. Gasoline and distillate inventories decreased 1.8 MMBbl and 2.0 MMBbl, respectively. Total petroleum inventories showed a large increase of 7.2 MMBbl. US crude oil production was higher by 100 MBbl/d compared with the previous week (per EIA). Crude oil imports were up 0.22 MMBbl/d to an average of 6.8 MMBbl/d versus the week prior. WTI prices maintained their bullish gains with news of Venezuelan production declines and the stern commitment by Saudi Arabia to bring Brent up to $70, which was achieved last Friday. The positive bias of tightening supplies was confirmed with a Reuters report showing OPEC production in March fell to its lowest level in four years and Saudi Arabia bringing its production below its committed quota. Chinese factory activity showed its sharpest rise in eight months, easing some of the concerns about a global economic slowdown and bringing longer-term bullish bias to the market. Another element residing in the trade is the upcoming expiration of the sanction waivers allowing eight countries (China, Japan, India, Turkey, Italy, Greece, South Korea and Taiwan) to continue to buy Iranian crude. The US administration will have to extend, modify, or end the waivers. Last November, when the Trump administration announced the waivers, prices dropped precipitously as the trade had built significant positions around the Iranian sanctions. The US has until May 2 to decide what to do around the sanctions and waivers. However, the chart below shows that the Managed Money long sector has increased positions during the recent price run, seemingly placing a bet on waivers ending. It should also be noted that the total position of this sector is well below levels achieved last fall as the market headed into the sanctions. The CFTC report (positions as of April 2) confirmed the speculative commitment to the current bullish trend. The Managed Money long component increased by 12,486 contracts, while the short component was forced to cover 6,165 contracts. It is becoming clear that the speculative bulls are adding positions on any type of retracement, in spite of the bearish inventory report. This is likely associated with the pending decision on waivers. The report also identified the Merchant short position increasing by 13,993 contracts. These gains were the first in a while and confirm that producers will hedge as prices eclipse $60.00/Bbl and remain there for an extended period. Last week’s trade closed over $63.00/Bbl, the highest weekly close since the last week of October 2018, just before the market declines accelerated. Market internals have developed a bullish bias, however, and are now entering overbought levels. Volume was stronger week over week but declined later in the week as prices rallied to the highs. Finally, open interest showed some gains, which is important as these two elements (volume and open interest gains while prices rise) are required for any sustained run in prices. With prices having closed over $63/Bbl and Brent near the Saudi target, further extensions taking prices between $65 and $68 (an area of consolidation from last fall during the price collapse) will likely run into selling from the US producers (witnessed last week). Should prices follow a consolidation phase for WTI trade, a potential retracement to the breakout area around $57.96-$60.00 should be expected. Natural gas dry production showed a decrease of 0.34 Bcf/d week over week. This decrease mainly came from declines in the South Central and Mountain regions, with a slight offset from gains in the Northeast. Canadian imports increased slightly, gaining 0.02 Bcf/d on the week. Driving the demand gains this week, power demand gained 0.83 Bcf/d. Res/Com demand fell 0.11 Bcf/d and Industrial demand gained 0.28 Bcf/d. LNG exports declined 0.21 Bcf/d on the week, while Mexican exports were relatively flat. Totals for the week show the market lost 0.33 Bcf/d in supply while demand gained 0.80 Bcf/d. 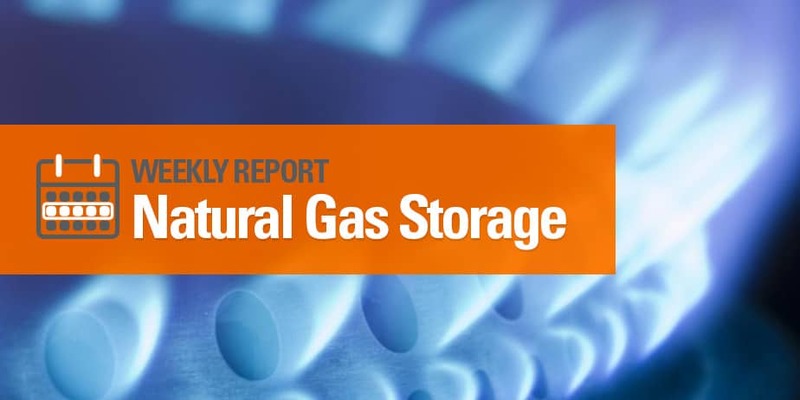 The storage report last week came in with an injection of 23 Bcf. Total inventories are now 228 Bcf below last year’s and 505 Bcf below the five-year average. The CFTC report (as of April 2) showed the Managed Money long sector reducing positions by 16,044 contracts while the short sector increased by 2,703 contracts. The speculative elements in this market are beginning to reflect a potential trend coming into place as the long sector has reduced positions while the short sector increases. This is not yet a trend but is worth watching closely in the coming weeks as prices usually ascend entering the summer months. Should the shorts continue to expand positions during the seasonally strong period of the year, price action could become more volatile. Market internals remain neutral with a bearish bias, as the trade last week stayed in a $0.101 range and closed just $0.002 above the previous week’s close. Volume increased week over week, while open interest increased slightly but remains well below historical norms. The lack of open interest with little directional bias suggests that the natural gas commodity as a trading instrument by the larger funds is very limited. The failure of prices to seriously test the previous week’s high signals that the market has a potential test of major support between $2.52 and $2.56. Historical price action shows the lows are established in late winter (usually February through April) before prices firm up going into the summer power demand period. If this market is headed for a test of the well-defined support, such a test is likely to occur before the end of the month. Prices last week could not garner the support to test the previous week’s high at $2.77 and found selling at $2.73. Expect prices to find additional selling this week. The market will have to develop the interest by traders to take prices to major resistance around $2.857-$2.908, which is unlikely at this point. All signals indicate an extension downward this week. Prices were up and down among NGL products last week. Ethane dropped $0.021 to $0.214, propane was down $0.055 to $0.617, and isobutane was down $0.050 to $0.763. Normal butane increased $0.002 to $0.744, and natural gasoline was up $0.007 to $1.279. US propane stocks increased ~1.6 MMBbl the week ending March 29. Stocks now sit at 53.2 MMBbl, roughly 16.9 MMBbl and 11.6 MMBbl higher than the same weeks for March 2018 and March 2017, respectively. Weekly waterborne imports rose slightly week over week, according to customs manifests. The growth was due to an increase in PADD 1 imports, which rose to 819 MBbl/d. PADD 3 fell slightly to nearly 1.95 MMBbl/d, and PADD 5 was nearly 550 MBbl/d. Imports from Venezuela have almost disappeared from US shores, but we did see three imports last week. The Tarbet Spirit delivered 471 MBbl of Hamaca Blend to Chevron Pascagoula. London Star delivered 304 MBbl of Diluted Crude Oil (DCO) to Citgo Lake Charles from Aruba. Finally, Yasa Golden Bosphorus delivered 485 MBbl of DCO to PBF’s Chalmette refinery from Cul de Sac on St. Lucia. With March in the rearview mirror, we can see that imports from Saudi Arabia did increase slightly from February but remain quite low. Saudi Aramco’s refinery Motiva Port Arthur did resume imports in March after importing virtually no Saudi crude in the first two months of the year.